These are my TV antennas as of August 2014. The top antennas are a pair of 91XGs at 71 feet. The PWB balun has been replaced with a coaxial balun to reduce the loss by about 1 dB. The antennas are combined through a nearly zero loss combiner using a quarter wave matching section to transform the impedance from 37 ohms to 75 ohms. The preamp is a Tin Lee MA-25U-77A 30 dB gain and 1.5 dB noise figure. The middle antennas are a pair homemade 12 element log periodics for high VHF (channels 7-13) at 68 feet. The antennas are combined through a nearly zero loss combiner using a quarter wave matching section to transform the impedance from 37 ohms to 75 ohms. The preamp is a Kitztech 200 with 24 dB gain and 0.5 dB noise figure. Click on the link below for construction details. 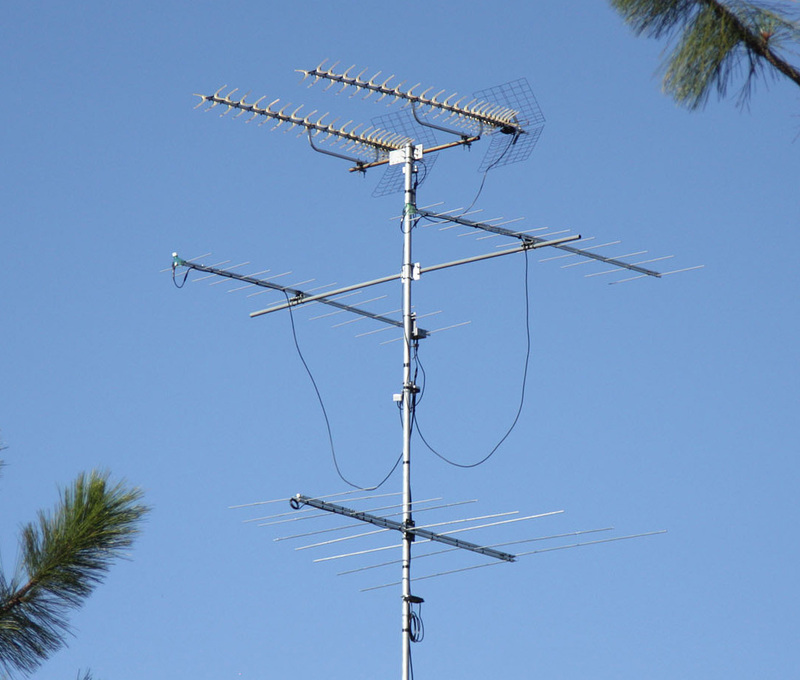 The lower antenna is a homemade 8 element log periodic for low VHF (channels 2-6) at 62 feet. The preamp is a Winegard AP-8700.